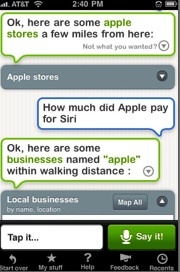 How much did Apple pay for the acquisition of Siri, the maker of a mobile virtual personal assistant app? Apple won’t say, and neither will the company or its investors. I spoke with two Siri board members today, and neither would go near the subject. “I can confirm the transaction has happened, but nothing about the transaction itself or Apple’s plans,” says Gary Morgenthaler of Morgenthaler Ventures. “All I can say is we are pleased,” says SRI’s Norman Winarsky. I even asked Siri’s app on my iPhone. It directed me to a nearby Apple Store. But if the buzz in Silicon Valley is correct, Siri’s investors have a lot to be pleased about. I’ve been digging around. Sources I trust with indirect knowledge of the transaction peg it at between $150 million to $250 million, with the strongest rumor being “more than $200 million.” Siri’s investors put a total of $24 million into the startup, so that would make the exit at least an eight-bagger. Why did Apple pay so much for an iPhone app company? When you look at Siri as an iPhone app with only about a quarter million downloads of its free app, the price seems very expensive. But what Apple really bought was an entry into mobile search. If you look at it that way, $200 million could turn out to be a bargain. There is also the possibility that Apple was worried Google would once again swoop in and outbid them for Siri as it did with AdMob. Siri could have added a unique voice-enabled search experience to Android. (While only its iPhone app had been released, an Android app had been developed internally). For years there have been rumors that Apple wanted to build its own search engine. Most recently, Apple analyst Gene Munster floated the suggestion. But these were always characterized as traditional search engines. It would be foolish for Apple to try to beat Google at its own game. Rather, it is attacking Google from the side, with advanced technologies Google has yet to master. Siri is not a traditional search engine. It is only good at very specific types of action-oriented searches, and it ties into dozens of services on the Web to actually help you accomplish what you want to do, from booking a taxi to making a reservation at a nearby restaurant to buying a movie ticket. “Unlike a search engine it so more of a do-engine,” explains Winarsky. “You have a goal-based query plugged into a bunch of srvices, and it does the action.” It is an intelligent agent, and many of its technologies are based on SRI programs the government funded to the tune of about $200 million years ago. So the intellectual property alone is worth a ton. But presumably Apple is also getting the Siri engineering team, which can help lead its mobile search efforts. And the voice interface is particularly mobile-friendly. When you ask Siri questions, it comes up with not just answers, but actions it can perform on your behalf. No typing required. Siri was going to make money through affiliate links and leads as users take suggested actions, sort of a cost-per-action model. Google is pushing voice search on mobile devices as well, but its voice search just creates a regular search query. Siri does not perform a general Web search. It tries to understand the user’s intent using natural language processing and semantic systems (are you looking for a flight, a concert, a taxi, a business) and then plugs the search into the relevant Web services. It supports more than 40 services right now, but it is designed to support hundreds or thousands. There were also plans to open up an API to developers so that Siri could more easily ingest this type of data. Whether Apple decides to take a similar approach or take the core technology and start from scratch remains to be seen. But make no mistake. Apple sees itself as a mobile computing company, and mobile search is now part of what it does. One way or another, you can expect to see Siri’s mobile search capabilities make their way into every future iPhone and iPad.